Once a spacer, always a spacer. And no dirtside job—even one as nominally glamorous as Commodore of the Rim Worlds Naval Reserve—can keep a bred-in-the-bone spaceman like John Grimes out of the void for long. Older and wiser, he’s nonetheless nostalgic for his days in the Survey Service, so when the stars call, he gladly leaves the paperwork behind and heads off for adventure. Now practical, hard-headed Grimes is not the sort to believe in ghosts. But he’s willing to give psychics a chance when shapely Sonya Verrill, a commander in the Federation Survey Service, proposes a ghost-hunting expedition in the sector around Kinsolving’s Planet. Out where the fabric of space wears thin, ships have encountered Rim Ghosts—apparitions of craft and crewmates from alternate universes. When Grimes organizes a séance to make contact, their ship is yanked Into the Alternate Universe, and their only hope of getting home again may lie in a lost relic—a sleeper ship from the first age of space exploration. After their wild ghost chase, Grimes and Sonya resign from their respective offices and embark on a wholly different adventure: marriage. But running their own little shipping company takes a back seat to danger when a distress call leads the pair to an alien ship from an alternate universe—a ship carrying Contraband from Otherspace—mutant rats who evolved to rule their universe…and threaten to break through to ours. 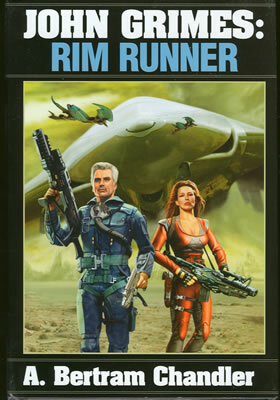 Grimes is drawn into four perilous adventures, when a ship full of religious fanatics uses a psionic to summon God, when a rogue Rim Worlder tries to sell advanced weaponry to the robber barons of Tangaroa, when trouble in the form of a predatory starfish threatens to ruin the economy of Mellise, and when an impossible planet appears out of nowhere—a world where dragons, fairies, and sleeping beauties are real. Another visit to Kinsolving’s Planet, where the boundaries between reality and surreality are almost non-existent, finds The Commodore at Sea. For he is whisked to a continuum in which fictional characters exist, and he is surprised to meet Sherlock Holmes, Lady Chatterly, Tarzan and Jane, and…A. Bertram Chandler?